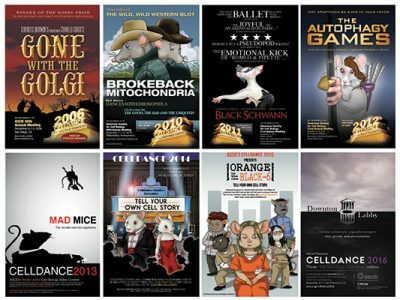 Posters advertising past Celldance videos are favorites of staff and members alike! logy community at large about their peers and their research. The final videos will premiere at the 2018 ASCB|EMBO Meeting this December in San Diego. Celldance is a program supported by the ASCB Public Information Committee to promote public engagement and education in cell biology, as well as to help cell biologists develop their skills in video-based science communication and storytelling. Is your lab interested in submitting a proposal for Celldance 2018? All you have to do is send us a one or two page story outline (in a narrative, storyboard or script format) plus a short video sample of your most beautiful/most exciting cell imaging. These samples do not have to be the video sequences that you will use in your actual Celldance video! Deadline to submit your proposal is June 15. Submit your Celldance video proposal today!